Operation Garden is well and truly in good swing. We began doing the garden when my dad passed his half of the house over to myself. Our garden before this was, well, different. We had 5 sheds, a dog run, a greenhouse, a caravan, a hedgerow with thorns, a winding path which was basically overgrown and covered in grass. Not forgetting the grass itself which was uneven oh and three flower beds. We also have a really large driveway for the cars. Who needs five sheds, seriously? We don't have many or very clear photos of the garden before hand, but you kind of get the idea from this. So starting at the top, we had 3 sheds, a dog run, a greenhouse and a caravan up here. We are now down to 1 shed and 1 dog run. This will be the area for one large shed, one large dog run and Jacks play area. 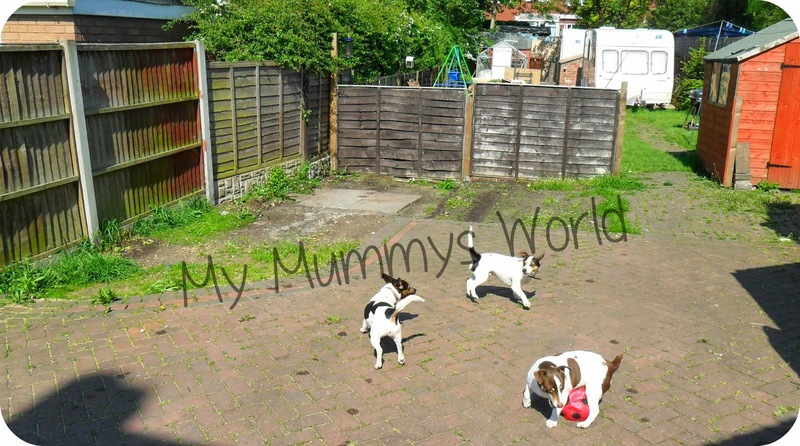 We will be extending the current dog run giving them lots more room to run around when we aren't at home. We will be placing a larger shed in the corner which kicks out from the remainder of the garden out of the way. The remainder of this area, an 'L' shape will be barked and feature lots of play things for Jack and friends. When we have a little more money I hope to upgrade all of Jacks toy to something more stimulating. So getting where we are now, we had a lot of ground and soil to level, in fact we dug it up, riddled it and placed it on the new flower bed area, grass area and filled a tonne bag. We also had to removed the stones which the caravan was parked on and lay the bark. We've began to render the dog run as it looks ugly so we can paint a chalkboard on the side and paint the front white to make it more pretty. Next up, the middle of the garden, this is the part we are currently working on. This part, in fact all up the one side of the garden, featured a large hedgerow with thorn bushes in. Last year we began to take this out on our owns, but that proved a little to difficult so at the end of the year we hired some tree surgeons to take out the hedgerow and 3 trees which were in the way - done in half a day. Anyway, this part of the garden will feature one side as part grass, with a raised flower bed for mum to place her flowers and maybe feature a water feature. Down the centre we will have a straight path, we will be having a pergola at the end of the path with a gate inside. The other side of the pathway will be a large patio area and again more grass, this side we are leaving until last though. We have started building the flower bed and moving some of the flowers over. We need to build a double skim wall along to complete the flower bed. We then need to finish filling in the path with concrete so we can purchase some plum slate to complete this area. We have planted some grass seed on this area of the garden, which has now begun to grow but I think we will need some more. That then leaves the end of the garden nearer the house. This is currently all block paved but so hard to upkeep, eventually we will consider tarmacadam for this area. 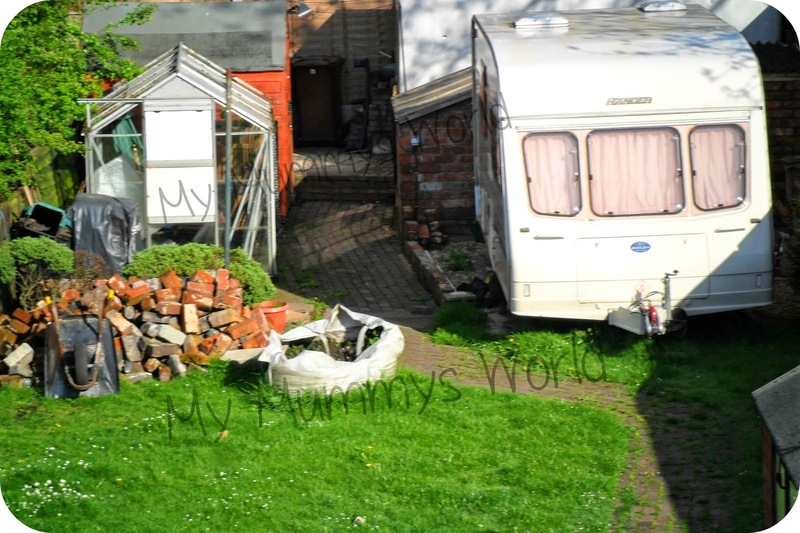 The flower bed in this area will be demolished and the two sheds will becoming just one for the tumble dryer. This area will be the final area to be done as its fairly simple. 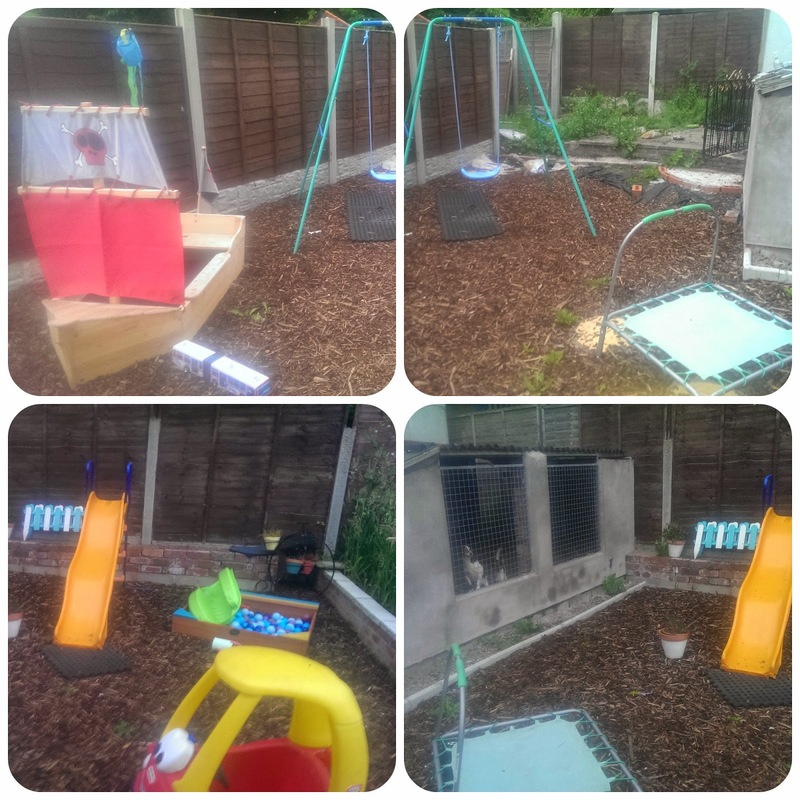 This is the garden currently, again not the best photos but its a work in progress. I know we have worked an incredible deal on this garden but looking back through the photos - we really have and its beginning to show. Maybe you can't tell from photos but I really can. So we are still a long way from completion but we have also come so far from where we were at the beginning. I now need a lottery win so we can complete it and add furniture. Looks like you have done a great job! I love the little play area. It's looking really good, well done. We have a lot to do on our garden.